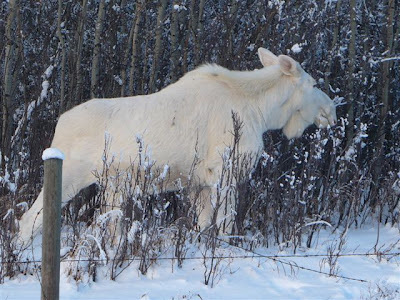 this is an albino moose. a cow, with 2 calves. the pictures have beeen circulating - i'm not sure who took them. but they're interesting critters, so i thought i'd share a couple of them. they're quite rare, but not miraculously so. twin calves are not all that common either. 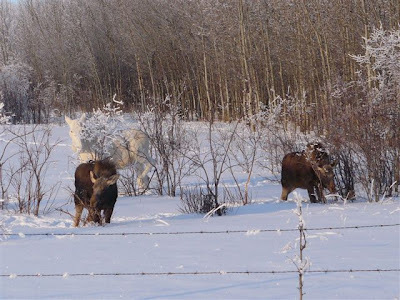 there was an albino bull moose wandering in the wild country near the town i grew up in, when i was a child. a fellow who was know to be a tad reckless with the truth reported seeing it, but no one would believe him. after several reported sightings had been scoffed at, he happened to sight it again with a gun in his hand. "NO," you're thinking. "he didn't!" oh yes, he did. he shot it, to prove that for once in his live he was telling the truth. it's now stuffed and standing proudly in the Grande Prairie Pioneer Museum. These albino animals are so unusual - I love them! Well, at least the poor beastie was stuffed and kept and not just cut up and eaten and made into a rug or something! she camoflauges well in winter, doesn't she? unusual, yes... a friend of my older brother, years ago, had albino coloring. he always wore sunglasses, and his eyesight was very poor. it's hard to tell if this moose has the pink eyes, but moose aren't known to have great eyes, anyway, i guess. I understand such a specimen would be rarer than hen’s teeth? Presumably the photo is of a wild moose, and none are domesticated or hybrids? I read about continuing accidents on your roads involving moose, with some fatal collisions. LL - yes, they're rare, but not as rare as might be thought. and yes, she's a wild moose. they don't domesticate well, though there are stories of homesteaders taming them somewhat, if found as a small calf. they have been known to breed with domestic cattle, but the offspring are usually stillborn. the odd one that survives is sterile, like a mule. i saw one once, poor thing. the cows didn't like him, and he couldn't survive in the wild.... and yes, most of us up here have a moose story or 2 to tell. my most exciting close encounter of the moose kind was fatal for the moose, but my little Ford Ranger and i survived with only small damage... a miracle for which i am most grateful. I wonder if the other moose treat a white moose any differently. Probably try to hide behind it in the snow! I've seen this set of photos a couple of times now. There was an albino crow living near here a few years back - that was interesting too. Gary - i'm not sure where the photos were taken... could be almost anywhere in moose country. moose seem just generally grumpy to me, and not very sociable. do they even get along with each other? someone i know had an albino robin hanging round their home a few years ago.